This section is about safety efforts to increase motorist awareness that motorcyclists are present in the traffic mix. Motorist awareness campaigns might be second only to training as the most often implemented component of a State’s motorcyclist safety program. Like training, good communication and outreach awareness programs can be expensive to develop and implement. Given how frequent these types of programs take a leading role in motorcyclist safety efforts and how expensive they can be to implement, one would assume there is abundant clear evidence of the effectiveness of such programs. Not so. There are no direct evaluations of the effectiveness of campaigns to increase driver awareness of motorcyclists. Statistical data on crash causation do reveal that when motorcyclists crash with other vehicles, the other vehicle driver has often violated the motorcyclist’s right-of-way (ROW). Drivers may not expect to see motorcyclists on the road and may simply not recognize a motorcyclist in their direct line of sight. Crashes that happen when a driver pulls into the path of an oncoming motorcyclist and claims not to have seen him/her approaching are often called “looked but failed to see” (LBFS) crashes. 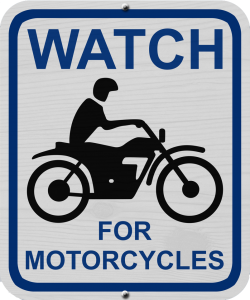 These programs are based on the assumption that if drivers look twice, pay more attention, or are reminded that motorcyclists are on the road, they would actually “see” approaching riders and the result would be a reduction in motorcyclist right-of-way violations by other motorists. This assumption does not seem consistent with the research on how our eyes and mind work together. We encourage readers interested to investigate the research related to inintentional blindness and change blindness. In addition, ROW violations may occur because car drivers see the motorcyclist but fail to correctly judge the path or speed of the motorcyclist and accept an inadequate gap. Motorcycles and their riders do present smaller visual targets than cars or trucks, resulting in assumed lower conspicuity. The current research tells us an effective way to increase the likelihood that other motorists will detect a motorcyclist is to increase the conspicuity of the motorcycle and rider. Motorcyclist awareness materials are available from a variety of sources. A web search for “motorcycle awareness” and similar terms will result in millions of hits including hundreds of images for posters, brochures and billboards. This paper provides a comprehensive review of past research that examined motorcycle ROW accidents. Two major causes of such a crash scenario are the lack of motorcycle conspicuity and motorist's speed/distance judgment error, respectively. This report discusses several measures and their potential effectiveness to reduce conspicuity-related motorcycle crashes. There is evidence that bright and reflective clothing has a positive effect on crash risk. However, it is difficult to recommend one type/color of clothing to improve conspicuity in all conditions. Conspicuity of a motorcycle is especially difficult from the front-view; therefore, improving frontal light configurations would seem a good way to improve motorcycle conspicuity. It is evident that expectancy plays a role in the perception of motorcycles. However, it is less clear if and how expectancy of motorcycles in traffic can be increased long-term. It is probably not very effective to emphasize the presence of motorcycles in driver training. Finally, it is important to realize that people, even when they are highly motivated, are limited by their capabilities; they commit errors. In this respect, measures should focus on improving the system and reducing the consequences of these errors and not on improving people’s capabilities. This report proposes a framework for interpreting the literature and evidence on car drivers’ skills and attitudes towards motorcyclists. The framework relates attitudes, knowledge and skills/strategies to three behaviors: Does the driver look at the motorcyclist? Does the driver realize that it is a motorcyclist? Does the driver correctly decide whether the motorcyclist poses a hazard? The authors tell us that it is quite possible that advertising campaigns such as “Take longer to look for bikes” fail to reduce right-of-way-violation (ROWV) crashes for a number of reasons and while this type of campaign may appear to be sound advice, there are many factors that may need to be considered when future interventions are designed.